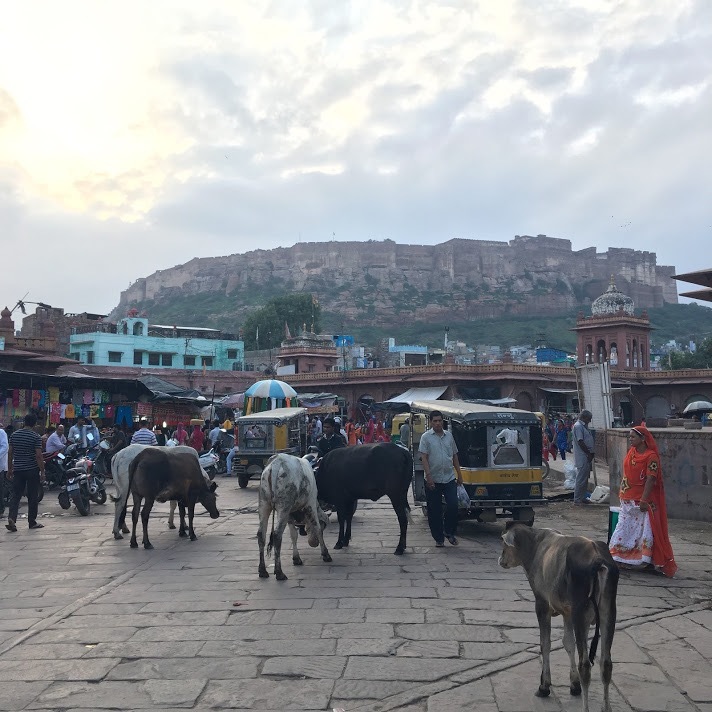 I knew India would be a culture shock; the crazy traffic, the dirt and the rubbish, the relentlessly spicy food – they’re all things that were meant to plunge me into the most unfamiliar of experiences. They did, of course, but nobody mentioned just how many animals there would be. Mumbai, my starting point, gave me little idea of what was to come, but my ensuing four weeks made me realise just how much Indians coexist with animals. In England, the line between the animal world and the human world is pretty well defined, with only birds and domestic cats and dogs blurring the line a little. Cows, pigs and sheep are in farms while monkeys, camels and elephants are penned up in zoos. Most dogs are collared and they walk beside their owners, if they’re not indoors. I’m not necessarily advocating such a divide, but it’s certainly what’s normal from my Western point of view. I arrived in Varanasi only four days after landing in India. It is the holiest of the seven sacred Hindu cities, sitting along the banks of the Ganges, and it is absolutely rammed with cows. The cow is the holiest animal in India, and in the majority of Indian states it is illegal to slaughter them. There are terrible recent stories about mobs lynching people who have been suspected of killing a cow. So, to me, the cows looked out of place, as if they had spilled over from a nearby farm – but it was in fact entirely normal here. They stood in the middle of extremely busy and chaotic roads looking totally unperturbed. Indians admire the cow for its gentleness and serenity and I could see why. 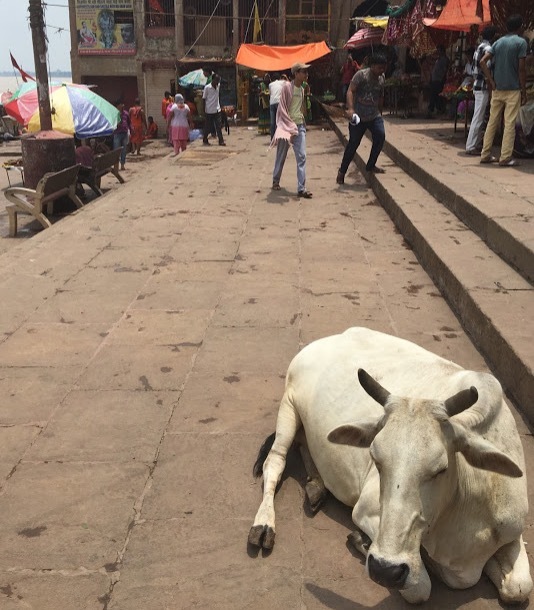 The centre of Varanasi comprises a large network of winding, narrow alleyways and we frequently found these blocked up by cows. It was a little comical, but we always felt a bit uneasy when passing them close by. We realised that it was a tension that we had to get over quickly if we were to embrace Indian culture properly. Locals would regularly step outside to feed a cow or smear one with paint. Cows sit around and populate the streets of so many Indian towns and cities, almost as ubiquitous as pigeons in the West. The main difference being that the cows are welcome. Of course, places like Mumbai and New Delhi have their fair share of pigeons, too. 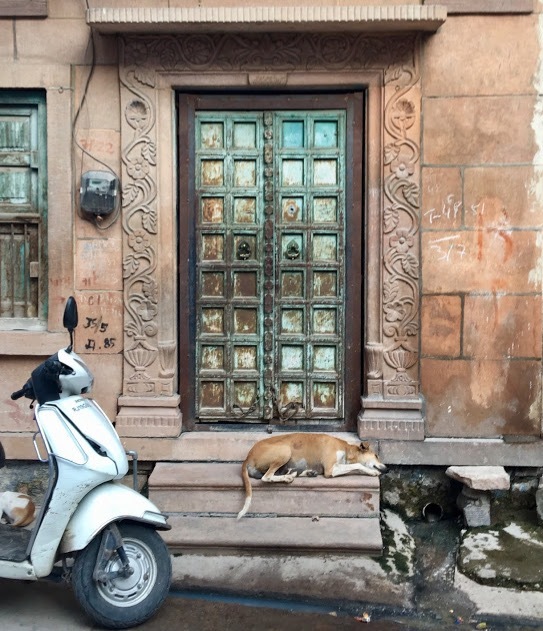 The only mammal that’s more common than the cow in India’s urban areas is the dog. I had expected stray dogs, but not this many. If you pointed your camera down any street and took a photo, there would be a dog in it. So many dogs were surprisingly gentle and friendly but also pretty much untouchable because of how filthy and flea-ridden they looked. It got rather grisly, too. On our first night in Varanasi we saw a dead dog on the roadside practically coated in flies, and the next evening its head was missing. The only thing worse than the sight of it was the smell. One time, we saw a couple of dogs tearing into the neck of a dead cow and eating away. 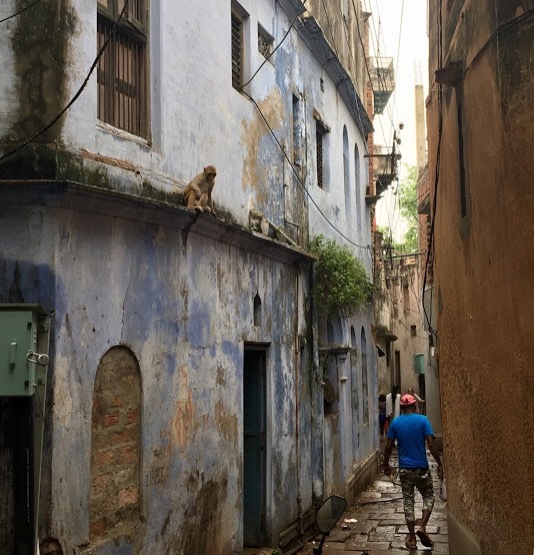 It’s a scavenger’s life for the Indian stray dog. Once we entered Rajasthan, the number of goats and pigs wandering the streets also reached ludicrous numbers. Then there were the more exotic animals: the parakeets, elephants, camels and monkeys. The rose-ringed parakeet colonised London a few years ago, but if you were lucky you could sometimes spot a beautiful plum-headed parakeet in India, along with kingfishers and golden orioles. The parakeets in New Delhi share the sky with black kites, a scavenger bird that hangs over the city in colossal numbers. You could look up from almost anywhere and there would be a cloud of black kites circling in the distance. En masse they look spectacular, if not a little sinister. The elephant and camel situation was difficult to navigate because of the ethical problems. Most of them live in captivity and are used for tourist rides. You receive various assurances that the animals are treated well but it’s right to be cynical. 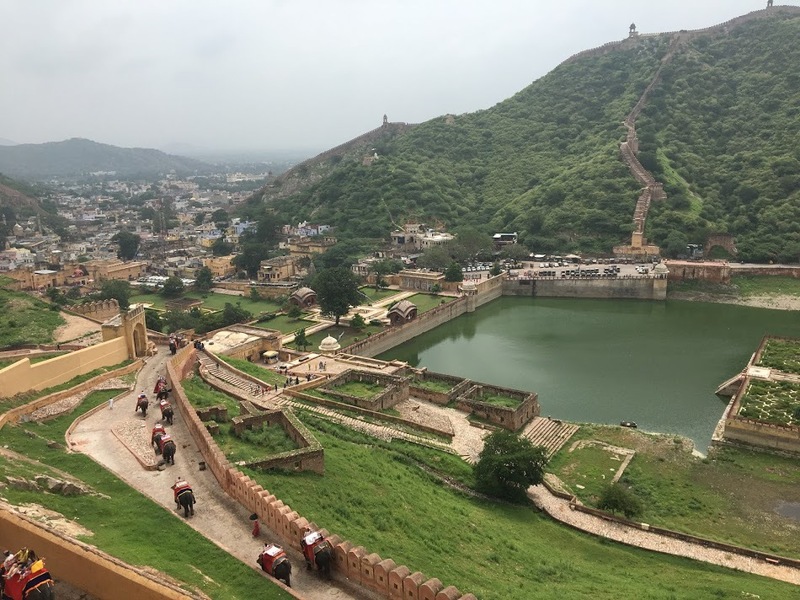 Around Jaipur fort, elephants carry tourists up and down the hill all day. 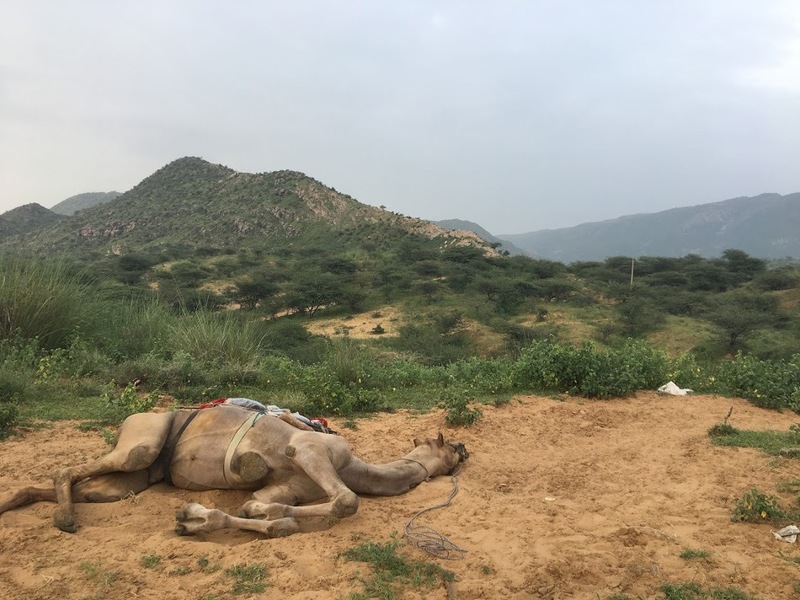 We took a camel ride through the desert just outside of Pushkar as part of our tour in the middle of the trip. It was amazing, only it was very painful to straddle something so wide for over an hour. Monkeys are undoubtedly the most exciting animal kicking around the urban areas of India. They are everywhere – all you need to do is look up. While my fears of aggravating the dogs and cows were relatively unfounded, it was right to tread on eggshells around the monkeys. Families of muscular Rhesus macaques and Hanuman langurs patrol the rooftops, and they will even interpret eye contact as a sign of aggression. So, they were fascinating to watch as long as you didn’t get caught watching. They’ve got natural weapons in abundance - teeth, claws, biceps, speed, agility – and if they wanted something in your hand then they generally got it. 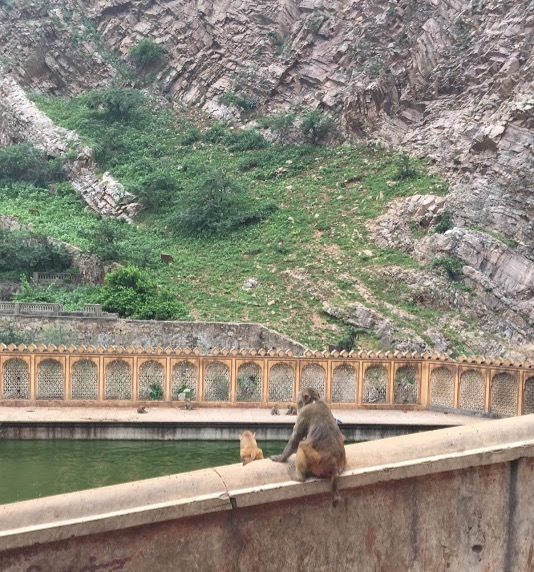 In Pushkar, we had to feign throwing rocks to keep the langurs at bay as we ascended the huge hill that looks over the town. Of course, the Indian tiger can deal with any rabble of monkeys, but we never saw one. Not even on our bespoke tiger-spotting trip around Ranthambore National Park. India's most beautiful and symbolic animal may have eluded us, but we made up for it with a load of quantity.